Dr. Jones is Vice-President for Georgia Cancer Specialists and serves as the principal research investigator in Macon. She is an active participant in the GCS Quality, Research and Therapeutics Committee and also is a Medical and Quality Director for Northside Hospital Cancer Institute. Dr. Jones served as the President of Bibb County Medical Society in 2004 and as the American College of Surgeons’ Cancer Liaison Physician and Chief of Staff for the Coliseum Medical Center. 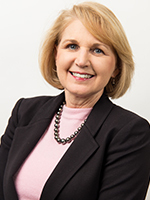 She has served on the Boards of Directors for the Medical Association of Georgia, for the Georgia Physicians for Accountable Care, the Middle Georgia Education Foundation, the Middle Georgia Affiliate of the Susan G. Komen Foundation, the American Cancer Society in Dougherty and Bibb Counties, and the State of Georgia. Dr. Jones is also a member of numerous professional societies. Georgia Cancer Specialists is a national leader in advanced cancer treatment and research. GCS's physicians provide care in 26 Northside Hospital Cancer Institute locations across Metro Atlanta, North and Central Georgia. GCS is The Cancer Answer®. © 2019, Georgia Cancer Specialists . All Rights Reserved.